Gathering around the piano to listen and sing along as skilled musicians pluck out famous songs is a popular pastime among many, but do you know why pianos exist? Who can you credit for giving the world this wonderful instrument? Bartolomeo Cristofori, the Italian harpsichord maker who is credited with the invention of the piano, was born May 4, 1655, in Padua, Italy, and died Jan. 27, 1731. 2016 marks the 285th anniversary of his death, so it seems the perfect opportunity to look back at the history of this important figure in musical history. Though many details of Cristofori’s life have been lost to history, we do know that he was appointed in 1688 to the Florentine court of Grand Prince Ferdinando de’Medici to care for its harpsichords and eventually the entire collection of musical instruments. An inventory of de’Medici’s instruments mentions an “apricimbalo,” or an instrument resembling a harpsichord, “newly invented by Bartolomeo Cristofori, with hammers and dampers, two keyboards and a range of four octaves, C-c,” notes a history published by the Metropolitan Museum of Art. The instrument was eventually called a “pianoforte.” An inscription by a Florentine court musician notes Cristofori first made the instrument in 1700. Cristofori’s pianoforte had the ability to change loudness according to the amount of pressure on the keys, achieved by replacing the plucking mechanism of the harpsichord with a hammer action capable of striking the strings with greater or lesser force, according to the Encyclopaedia Brittanica. Cristofori’s piano was complex and expensive, which caused many of its features to be dropped by subsequent 18th-century makers before being gradually reinvented and reintroduced in subsequent decades. Among his innovations was an escapement mechanism that allowed the hammer to fall away from the string instantly after striking it, so as to not dampen the string, while another feature incorporated a check that kept the fast-moving hammer from bouncing back to re-hit the string and a dampening mechanism on a jack to silence the string when not in use. Cristofori also used thicker strings at higher tensions than a harpsichord. Three of Cristofori’s pianos still exist, including the oldest which is located here in the U.S. at the Metropolitan Museum of Art in New York City (1720). The others are at the National Museum of Musical Instruments in Rome (1722) and the Museum of Musical Instruments at Leipzig University in Germany (1726). 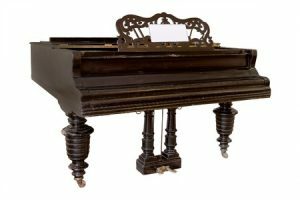 Though his invention was not well known in his lifetime and his design was ignored in Italy for quite some time, Cristofori’s piano eventually gained popularity in the time following his death – popularity that remains obvious still today. At East Coast Piano Rebuilding, we’re experts at making sure that your version of Cristofori’s instrument it playing at its best, whether you need tuning or repairs, and we can even help you find a piano to add to your home. To learn more, call us today at 603-887-4489.